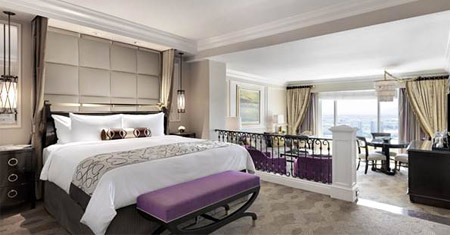 Experience luxury at The Venetian Resort Las Vegas. Located in the heart of the Las Vegas Strip, The Venetian Resort features all-suite accommodations, exquisite restaurants, celebrity chefs, world-class entertainment, nightlife, and shopping. The resort also offers Canyon Ranch® Fitness + Spa, a five-acre pool and garden deck, The Aquatic Club, TAO Nightclub, Grand Canal Shoppes®, Prestige at The Palazzo®, and a 120,000-square-foot casino and poker room to complete the all-encompassing resort experience. The Venetian Resort Las Vegas is the soul of Renaissance Venice. This integrated resort offers all the romance and grandeur of its namesake and more. 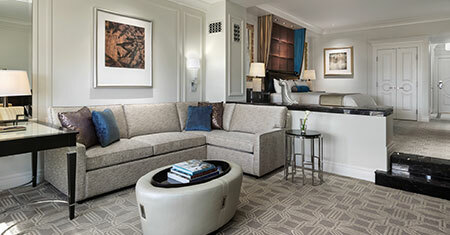 At The Venetian, every key unlocks a suite. Roughly twice the size of the average Las Vegas hotel room, each suite features an Italian-marble bath and sunken living room. Just steps outside these incomparable suites await the world’s most sought-after chefs, entertainers, shopping, and amenities. The Palazzo in The Venetian Resort is the apex of experience. This integrated resort offers guests a secluded place where beauty, elegance, and luxury hold sway. At The Palazzo, every key unlocks a suite. Roughly twice the size of the average hotel room, each suite features an Italian-marble bath and sunken living room. Just steps outside these incomparable suites await the world’s most sought-after chefs, entertainers, shopping, and amenities. Round trip flight via Southwest Airlines® to Las Vegas (LAS). Seats are limited and may not be available on some flights that operate during peak travel times and holiday periods. Flight and hotel rates may vary by day of week. Hotel surcharges may apply to weekends, holidays, and convention periods. Flights available on published scheduled service only. Rates may be subject to change until purchased. Discounts are valid per reservation before taxes are applied. Offer not valid on existing reservations and may not be combined with any other offer. Subject to availability. Restrictions apply. Apple Leisure Group is the tour operator for Southwest Vacations.